All SHPSNA members are eligible enter their registered purebred and partbred Highland ponies in this award competition. Entries must participate in 3 or more public events such as horse shows, clinics, parades, demonstrations, fund-raisers etc. during 2007. The award winner will be selected based on number of events attended, size of events, and effectiveness in introducing the Highland breed to new audiences. Documentation and photos of each event must be submitted with the entry form. Ponies and events they attend must be located in North America and entries must be completed by December 31, 2007. The award winner will be announced in January 2008. For an entry form please click here. 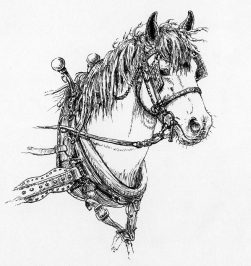 The 2007 Ambassador Award winner will receive a custom pen and ink portrait of their winning pony, similar to the example below. I am donating custom portraits for the Ambassador Awards in the hope of encouraging Highland owners to get out and introduce this wonderful breed to the North American public. Most people on this continent still have never even heard of, let alone seen, a Highland pony. I hope in the future other Highland pony enthusiasts will step forward to donate prizes for SHPSNA awards progams. If you have an idea for a specific award, or would like to donate a prize please let me know. Wishing you a successful season with your Highlands in 2007. © 2000-2007 artwork by Gwendolen Rowe. All rights reserved.